After spending the past three years in lectures and courses at university in Münster studying a lot about the theory and the history of pedagogy and education I felt it was time to go somewhere else to gain practical work experience. Not only this but also my personal curiosity and interest in getting to know different countries and cultures motivated me to do an internship for three months at Everton Nursery School and Family Centre in Liverpool. Before my arrival on the 31th of March 2014 I haven’t been to this place. So I didn’t know what to expect neither from my internship nor from the town that I would be living in. A friend once told me “Liverpool is very, you should go there, you will like it” à So here I am and I like it. Fortunately I got the chance to work in the Nursery School (Monday to Wednesday) as well as in the Family Centre (Wednesday to Friday). This gave me the opportunity to get to know two different sides of education and educational family support in early years. But it also showed me the importance of the connection between both sides. By working in Spencer class in the Nursery School I learned a lot about teaching in early years education. Seeing the differences and similarities compared to a german kindergarten was very interesting for me. And of course I really enjoyed playing, reading and spending time with the children in Spencer 1 and 2. Working in the Family Centre is very different to working in the Nursery School. No day is like the day before which gave me the chance to make a lot of different experiences. Going out on home visits, supporting staff at courses or everything else was always very interesting, informative and a lot of fun for me. I’m happy that I came here for my internship and got to know not only the nice area but also, and especially the wonderful, very supportive and helpful staff of Everton Nursery School and Family Centre. We have been nominated for Sustainable School of the Year at the Liverpool Echo Environment Awards. Our project with Clan and Liverpool John Moores University has seen our nursery children design and build a birdhide using revolutionary building materials. We will find out later tonight at the award ceremony if we have won! Thursday 27th March 2014 will be our first session of Internet Wizards. 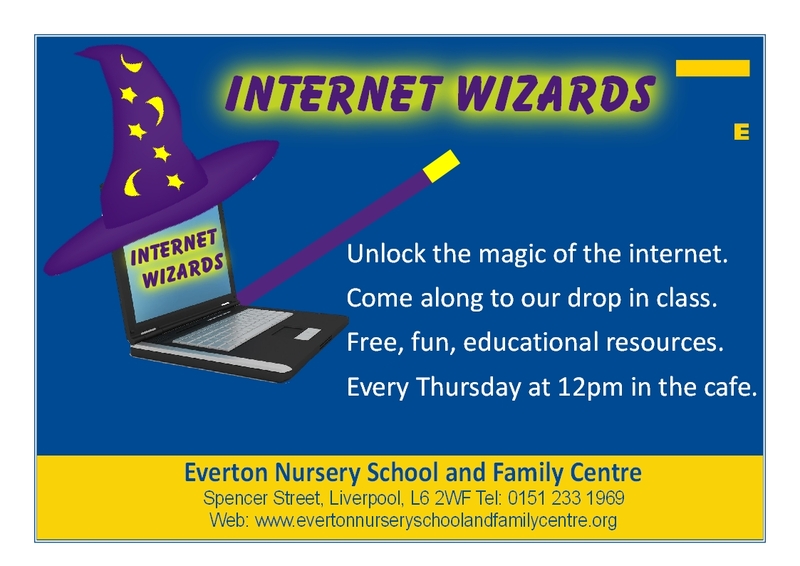 Internet Wizards is a drop in session for Parents and Carers which is hosted in our cafe. Every Thursday, Parents and Carers will be shown a wide range of fun, interesting and educational resources. We will use, desktops, laptops and iPads. For more information, please call 0151 233 1969 and ask to speak to Matthew! Come along and join Matthew Farrell for a free cup of coffee and a chat about E-safety at 9.30am on Friday 7th March 2014. We will look at a range of topics including Social Networks, Gaming, Images and Videos online and computer security. We will also look at a range of free resources you can use in the home with your children to extend their learning! Are you looking to introduce Baby Massage into your Children’s Centre? Need guidance for how to deliver Baby Massage? Then book yourself a place on our Baby Massage for Practitioners Course. A 4 day intensive course which will enable practitioners to deliver Baby Massage classes to Parents and their babies at their own settings. Join Lynne Gregory for Story and Rhyme, every Wednesday at 12.15pm -12.45pm. Babies, Toddlers and Parents/Carers are welcome to come along and enjoy a story and sing some rhymes. The group meets every week, if you have a favourite story then bring it along to share with everyone. For more information please call 0151 233 1969.